My name is Patrick Madden and I am pleased to offer basic to advanced knitting machine lessons for owners of all brands and models of home knitting machines at my teaching studio in Toronto, Ontario. All of my classes are taught privately, with lesson plans created specifically for each student based on their skill set, the pace at which they wish to learn and the style of home knitting machine they own. Please scroll down to view my Introduction To Machine Knitting Workshop and information on private lessons. My teaching studio is conveniently located in Toronto's west end near Islington and Kipling subway stations, Longbranch Go Transit station, with proximity to Highways 401, 427, Gardiner Expressway and QEW. For those travelling by air, Pearson International Airport and local hotels are just 10 minutes away. Union Rail Station is 25 minutes by car and I offer complimentary car service to the airport, local TTC/Go transit stations and hotels. Free parking is provided onsite for those driving. I am most happy to welcome you and schedule a knitting holiday where you can come and refine or learn machine knitting skills. Toronto is a great city to visit with many great local yarn shops along with wonderful attractions, restaurants and theatre. I am proud of my city and you are most welcome anytime. LEARN TO KNIT USING YOUR OWN KNITTING MACHINE OR USING A MACHINE MODEL OF YOUR CHOICE PROVIDED COMPLIMENTARY. You are welcome to bring your own machine to class or I provide knitting machines for you to learn on here at my studio. This is perfect for people who don't wish to invest in a machine of their own, who don't have the room at home or simply don't want to haul their heavy, bulky machine with them to classes. I provide knitting machine brands Singer/Studio, Brother, White, Passap and Superba, including manual, punchcard and electronic models. Contact me at 416-795-5500 or via email superbaknitting@gmail.com to discuss lessons. BOOK YOUR AT-HOME KNITTING MACHINE LESSON. An additional level of service I offer is to travel to your home for a travel time/distance fee in addition to the price of instruction. 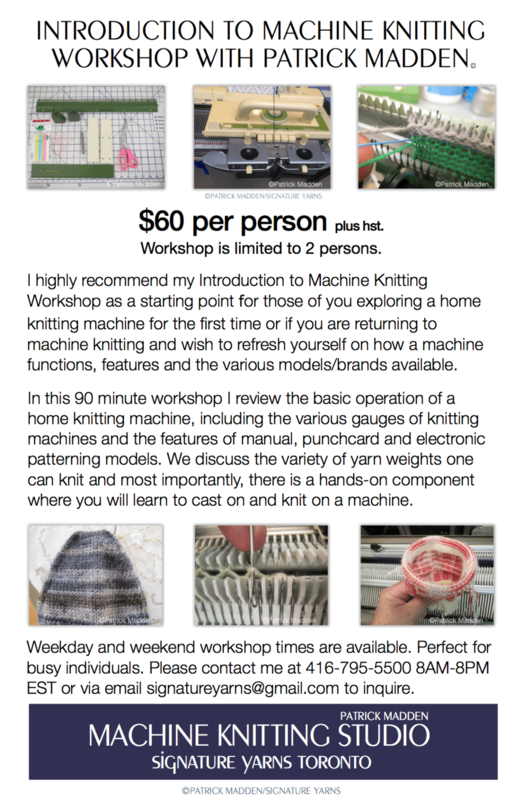 I offer this service to anyone living in southern Ontario and I am happy to travel anywhere in the world to teach machine knitting skills. This service is perfect for busy individuals, knitting groups and knitting guilds or people who don't want to deal with driving in Toronto. I am most happy to come to you. In addition to teaching I will also bring along current kits and new yarns for you to view in the comfort of your home. Please contact me at 416-795-5500 8AM-8PM EST or via email signatureyarns@gmail.com to inquire about your next knitting lesson, group workshop or a quote for me to travel and provide lessons/workshops in your community. I also provide training for designers and companies who manufacture their own product lines or for the purpose of product sample development. I can provide training for up to 6 people here at my studio in Toronto and I am happy to provide a quote for me to travel to any destination worldwide to train at your factory or business offices. Contact me directly at 416-795-5500 to discuss your needs and obtain a quote. I own and knit on Superba, Passap, Brother, Toyota, Knittax, Singer/Studio/Silver Reed Machines and I do so regularly as I provide custom knitting and fitting services, in addition to teaching, which helps keep my machine knitting skills sharp as I end up knitting on a variety of brands and gauges of knitting machines throughout the year. I have been knitting all my life and have a real passion for this beautiful craft, be it hand knitting or using a home knitting machine. A home knitting machine, like knitting needles and crochet hooks, is just another tool in the kit. I don't discriminate. I grew up in a home where my mother sewed and knit all the time and our family business was textiles. My mother Genevieve owned Gen's Sewing Centre with locations in Goderich and Exeter, Ontario. She was a Singer Sewing Machine dealer and also retailed fabrics and hand knitting yarn. In the late 1970's Singer started retailing knitting machines and it was then that I began my fascination with machine knitting in my teens, teaching at our store and at various knitting machine seminars in Ontario. I studied machine knitting and knitwear design at Sheridan College in Oakville, and have worked at various knitting mills in Toronto as technician, assistant designer and production manager. Later in my career I returned to working at various local yarns stores in Ontario where I've taught hand and machine knitting lessons and in 2014 I started my online yarn store and teaching studio Signature Yarns based in here in Toronto, Ontario. Currently I am the 2017 Chair of The Burlington Machine Knitting Guild, the 2016/17 Executive of Communications for the Toronto Knitters Guild. I also provide a free information blog for owners of Singer/Superba Knitting Machines made in France called Superba Knitting. My training, education and garment industry work experience combined with my custom knitting skills and having worked at my local yarn store for years makes me most proficient in all aspects of both hand and machine knitting. I bring a wealth of information about knitting machines, parts, accessories, techniques, garment construction, finishing and making garments that fit and I like to think I am a great teacher! I look forward to you contacting me for lessons. ©Signature Yarns/Patrick Madden. All rights reserved. Prices are subject to change without notice.